Hot Taps or pressure taps are different names for the same process. Hot Taps allow for a new branch connection without shut down of your piping system. Hot Taps are performed while your system remains live and under working pressure without any interruption of flow or services. Hot Tap connections can be performed on a multitude of line contents, such as hydrogen, hot and chilled water, steam, syltherm, natural gas, brine as well as many other elements. Pro Tapping performs Hot Taps from 3/4" to 36", 360° around the main. Hot Taps are generally performed on carbon, stainless and galvanized steel, copper and brass, fiberglass and specialized materials used in refineries and pharmaceutical facilities. Hot Taps can be performed on angles, elbows, tanks, vessels and more. Pro Tapping offers a cost effective way to perform a Hot Tap when welding is prohibited. The perfect solution is a Bolt-On Hot Tap fitting that can be used in restricted areas of office buildings, computer rooms and hospitals with installations on copper, brass and carbon steel pipes. Our experience with Bolt-On Hot Tap fittings ranges from complex refinery jobs to competitive HVAC work. We can customize the Bolt-On Hot Tap application to fit your needs. Pro Tapping provides Hot Taps that allow you the ability to install your probe and flow meters in a live line. The installation of a flow meter in your line allows you to monitor the temperature, pressure and percentage of a specific product in the line. Thermowells are the most versatile devices used to protect your probe and flow meter sensors from damage. 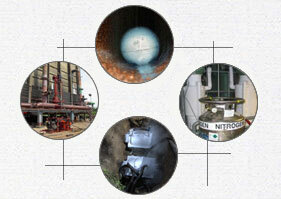 In addition, a defective probe or flow meter sensor may be removed without shutting down or draining the entire system. Pro Tapping can install your Thermowell through our custom designed and built Thermowell fittings. We maintain an inventory of these high pressure Thermowell fittings in the most common sizes. Small Hot Tapping Machine 1" - 4"
Large Hot Tapping Machine 6" - 20"